On November 20, 2017, I met up with Fiona de Köning at the Hollander & DeKöning building in Trenton. We had met a few years earlier through the Frenchman Bay Partners, a group of people and organizations that have an interest in conservation of the bay. 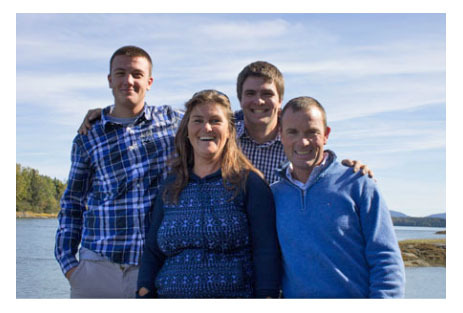 Fiona’s family raises Blue Mussels (Mytilus edulis), and one of their aquaculture sites is at Hadley Point on MDI, bringing them within the purview of the Coast Walk. She’s familiar with the project, so I called her up and asked if I could fling questions at her for an hour or so, and she good-naturedly agreed. Fiona: So, what do you need to know? Fiona: That’s interesting. So whether it’s recreating or working or living or those sorts of things? Jenn: Yes. It’s all relative to how we occupy and use the shoreline. Fiona: So yeah, it’s all marine stuff, and it’s a passion of mine, as you know. It’s a responsibility thing – we enjoy it and we want to take care of it, so we want to [run our business] properly. That means doing it well, which means doing it profitably, because you can’t do things well if you’re having to cut corners all the time. You have to be proud of what you can grow, and let it be a sort of an ambassador for the area if you will, and in order to do that you have to make sure that you take the responsibility seriously. So we really are the embodiment of a sustainable operation. … They’ve been doing it in a similar way since the time of Napoleon, more or less. So it’s not something that we’re reinventing, we’re just trying a slightly different way of growing them here. Jenn: How did you get into this? Fiona: I married into it. Theo is a fifth generation [mussel] farmer. … Anything marine-based, it tends to be your life. Any farming sort of operation, you tend to live it as well as do it. Jenn: How did you end up on MDI? Fiona: Theo was looking for a business opportunity, and we saw that it was a good environment, and it looked like the resources were good to start this product. Jenn: What kind of resources were you looking for? The de Köning family. Photo from Hollander & Dekoning website. Fiona: And they didn’t want to leave the state for college. They just love it here. It was hard work at the beginning. It was really hard. It’s still hard – when you start something from scratch there are a lot of things you need to learn, and it takes a little time to build your reputation in the market. It doesn’t come overnight. Alex is our eldest. He wasn’t sure whether he could bring that sort of commitment, so he got a degree in something that he was good at, because he’s good at Mathematics and Engineering, and then he didn’t want to go and work in some industrial hub somewhere else. He just loved it here so much. Everything’s connected and interconnected, on a personal level and on business levels. We’re all kind of working together in a place. People don’t tend to stay on the island if they don’t appreciate what it is. Jenn: You have to be pretty determined. Fiona: You do. You have to really want to stay here. Because eking a living out doing anything is not easy. And it’s worth it though. Jenn: What do you mean, “just”?! Fiona: I know. I was astounded. Fiona: Yes, occasionally, but I went to college in London, so I’ve done a lot of that in the past. And if you live in the Netherlands, which I did for 10 years as well, it’s very much more crowded, so there’s a lot of things easily accessible because it’s all close together. So I’ve kind of done that, but the wilderness and the wildness and the openness and room to breathe, … it’s so peaceful. … I don’t leave even for vacation. We hike and bike and enjoy the park. There’s just so much to explore. We’ve been here 12 years, there are still places I haven’t been and want to go. We go out and explore the outer islands a little bit with boats …, so it gets very busy. I tend to be more or less floating all of the summer. I’m not really on land very much at all, because … the views and wildlife, whales, I mean you see everything here. It’s just a little bit of paradise, quite honestly. Isn’t it? Jenn: And I love the interconnectedness of it. Fiona: Right, and that’s what lovely coming into the fall and winter time. I mean I like it that it’s busy because you get a totally diverse mixture of people on the island all summer. It’s fantastic, I love it, and I also like it when it calms down and you just get the community and you catch up with people you haven’t seen all year, and all the activities that are going on. It’s just nice with theater and music, and everything’s happening all the time. Jenn: I usually find that it is just as busy, but in a different way. Fiona: Isn’t it? But it’s in a more tight-knit kind of way, don’t you think? The community has time to breathe and actually focus on each other again, instead of serving the needs of all the people that are around you. Jenn: I’m interested in mussels themselves, and also in what you guys are doing with them. Fiona: They are wonderful creatures, and worldwide, very little is known about them really. I mean however long they’ve been food for people, people just don’t understand how their lifecycle works. There’s a lot still to learn about it, and with any farming, it’s a very long-term sort of commitment, because as you’re developing the area that you’re farming … I mean you know we don’t actually own the ground? It’s public trust ground where the farm sites are. 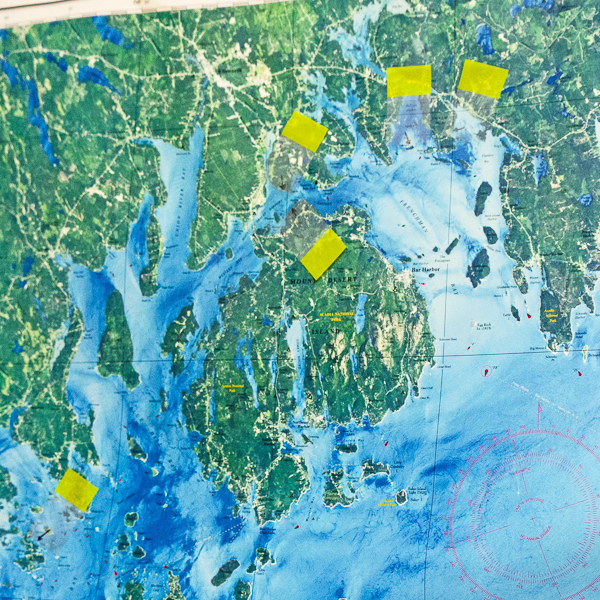 The way it works in Maine is that anything below … well, there’s some controversy about whether it’s the high-water or low-water mark, but basically sub-tidal, out until 12 miles out to sea, is under the state control, and it’s held in public trust. So it’s owned by all the citizens of Maine. [Ed.note: Maine is one of only a few states in which property lines can run out to the low tide line. In most states, they end at the high tide line. Not all land parcels were drawn up to include the low tide area, but many were. For more information: http://www.accessingthemainecoast.com/common_law_and_statutes/common_law_and_statutes.shtml] If you would like to be granted certain privileges for working in that area, via licenses or leasing or that sort of thing, you have to go through a process that is quite rigorous. It takes two to three years to go through that process, and then you’re granted it for a certain amount of time, and there are responsibilities coupled to that. 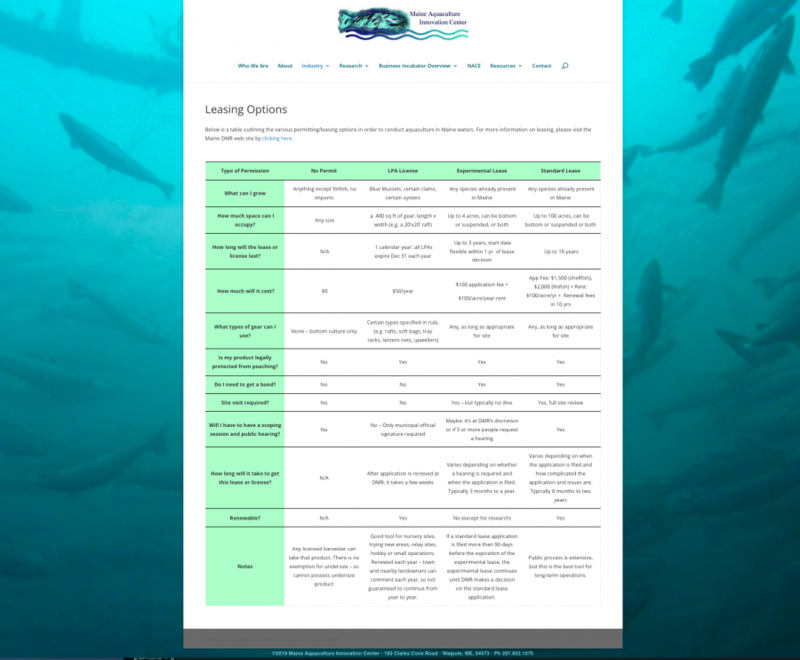 Aquaculture lease options in Maine For more information, check out the Aquaculture page on the Department of Marine Resources website. The lease regulations are quite well-managed. Even from a global perspective, they do a nice job, and it needs to be managed well, otherwise you can have people who are not … whether it’s short-cutting because of financial pressures, or lack of knowledge or whatever, mistakes can be made which are going to impact things for everybody. So it’s important you have a well-regulated system to lease areas to do farming. But as you learn that area … like in a garden, [each area] has different characteristics, and it grows things differently, and it’s the same with mussels on mussel farms. They have slightly different shell formation, color can be different, their growth rates can be different, the flavor can be definitely different from area to another. So there are a lot of nuances, and you’ve got to be a bit of a mussel freak to notice all of that. But it is interesting, and certainly it’s never dull. There’s always some factor or characteristic that’s changed. Everything’s a year apart at least, if not longer, because of the cycle and because of how long it takes to grow in the summer season, and the winter season and what can affect things in between. Finding causality can be quite difficult, so you’ve really got to keep your mind applied to it – observation, evaluation, try to figure out, ‘okay, so why’s this different this time?’ It’s not an exact science, at least it’s not for us. I think even with scientific back-up it’s not an exact science. There are too many factors. Jenn: So how do you farm mussels? Fiona: Okay. 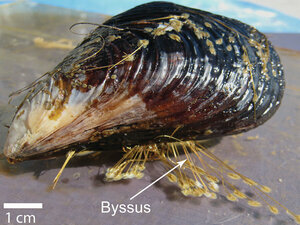 Well there are several ways to grow mussels, but we grow them on the seabed. 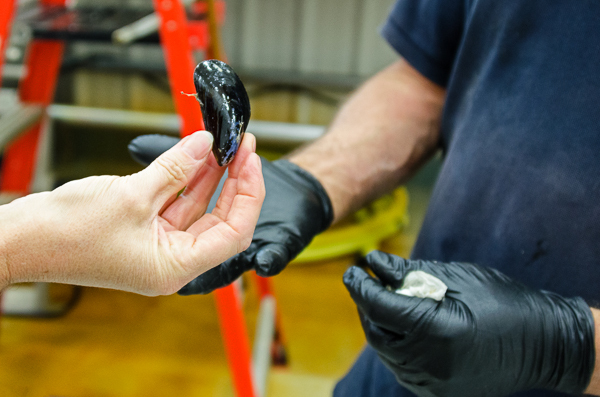 Aquaculture means you take seed [Ed.note: baby mussels roughly the size of a sunflower seed], you put it in an area and you help it to grow out to market size. During that process all sorts of things can affect it, and it is our job to try and maximize the growth and the health, so it’s not just big, but strong so that they transport well and the flavor’s good. So there’s a lot goes into it. … There are mussels everywhere in Maine. I think in southern Maine they’ve had more of a problem. Maybe it’s acidity or the substrate, but something’s affecting … the wild population. But mussels are very resilient, they’re found worldwide, and they can thrive under considerable pressure from various environmental factors. So they’re good. They reproduce themselves by making spat. They spawn into the water. … There’s a plankton phase, and they float in the water column for about two weeks. [They grow into] tiny little mussels which are on a thread, a bit like baby spiders are, … and they go with the tide. As they get more calcified, they start to get heavier. We don’t know what triggers this, but the tiny little mussels seem to sense what’s below them, and if they come to an area that they sense is good mussel bottom, they all let go of their threads at once and they rain down in huge quantities – that way they outnumber their predators. That’s their survival technique, otherwise they get eaten by pretty much everything. That’s how a new seed bank will form. Now if you leave that seed bank for a while as it is, most of it will die. It’s about 98% mortality, because they suffocate each other, they compete for food, [they get eaten.] They’re basically too dense to make it. We thin them out … by a certain percentage…. I’m saying it very quickly, but there’s a lot of monitoring, measuring, permitting. You’re being observed as well. We have a GPS tracking position voluntarily on our boat, so that the DMR and the Marine Patrol can see what we’re doing where we’re doing it. We’re really on the front edge of the policy formation around mussel farming here in Maine. Fiona: And I love it, but it’s a long process. … This is too important to allow everybody to have a free will on it, because you can impact [the environment] for further generations. So it’s my personal position that this needs to be managed properly, with the [view] that everybody should have access to it. You mustn’t close it out, but if you’re going to use the area then you need to use it properly and it needs to be monitored and enforced. In order to do that, we use a protocol [from] the Netherlands for harvesting wild seed. It has a Marine Stewardship Council certification over there. So we use that protocol with a few things that are different. It’s a very expensive process to go through that certification, and for one small company, particularly in the start-up phase, that’s really not possible to do. But … we’re using those standards to develop our farm. We’re volunteering information to our state regulator, saying ‘this is what we’re doing, this is how we’re doing it, this is the code where you guys can track our boat,’ and that way it’s all open and transparent. By thinning [the seed bank] out, you allow the ones that are there more room, and more food, and so they can spread out and they have a more successful chance for reaching maturity, plus you take the [harvested] ones to lease sites which are selected for good conditions to reach maturity. So they both reach sexual maturity, whilst otherwise if you’d left them where they are, predominantly they would have died. There’s no net depletion, that’s what I’m really trying to say. It’s possible to grow seed on ropes, but you need suspended equipment, like buoys and rafts and things in the waters. It’s more difficult for people to accept that form of aquaculture than it is for [farming] on the bottom, where all you’ve got to mark it are buoys that could be lobster buoys, nobody would know. So it fits in with people’s feeling of how Maine should be. We feel that it’s kind of a good fit. And it grows a lot of food. There’s a great deal of healthy, flavorful food comes out of this area, so it’s a satisfying thing to do. My part of the job is managing the policy. I serve on various committees at the state level as well, in order to learn what other things are happening. I have to hear what other working waterfront issues there are, because there are things that we may be impacting that I didn’t realize. You can’t be an expert in everything, but I think it’s a responsibility to at least try to find out what else is going on. That was the biggest challenge, getting that sort of communication link with other resource users and recreational people. There’s a lot of bridges that don’t get made between different groups on the coast. Fiona: That’s why I’m so supportive of the Frenchman Bay Partners. I was one of the first people involved in that group, because it opens those doors. It’s not an advocacy group, it’s a communication hub. A lot of it is science-based, and it crosses those boundaries that otherwise are hard to reach across. Jenn: It puts people like me and you in touch with each other. Fiona: Exactly. And me and the clamming people, and me and a kayak guide. Some industry, some riparian landowners. Those sorts of barriers to communication seem to be quite strong, so this is a good way to build some connection. Because you’ve got to try, but if you just go and ask, they don’t necessarily want to tell you. It takes time. You’ve got to build relationships with these groups and people, and show some integrity over time. … You know, people tend to be rather suspicious of anything new. Fiona: Yeah, and the people from coastal communities in the state of Maine have had a very tough history. They’ve had a lot of people coming in and telling them that [there is] a better way to do it, or they shouldn’t be doing it that way, and that has made them very defensive and closed to those sorts of approaches, and I can quite understand why. … Environmentally, things are changing rapidly, and if we don’t do something to learn and to try and adapt quickly enough, we’re going to be in serious trouble. I think that the rate of change of environmental and social issues globally right now is leaving us behind. It’s scary that it’s like that, we have to push forward with trying to find solutions, because otherwise [this won’t be here] for our grandchildren, if not our children already. So it’s kind of a passion really. Can you tell? Jenn: I think that a lot of people are a little bit stuck between wanting to defend what they have and needing to change, and very suspicious of new people who are coming in, worried that there’s not enough to go around. Fiona: Exactly, and ‘what’s going to happen to my family,’ so I have a huge amount of respect and understanding for that as a motivator, and have a little bit of a thick skin. When we’re looking for seed in different areas, we go to the shellfish committees in that town. We’ve been to meetings before and they flat out point-blank refuse to speak to us. Fiona: And then they’ll say, ‘Well you can come back next time,’ so we go back a month later, which is the next meeting, and then they say, ‘But we don’t have a quorum so we’re not going to make a decision anyway.’ And then you go back again and then they go, ‘Well okay, you’re obviously keen for doing this so we’ll talk with you.’ But you can’t be offended by that sort of thing because it’s almost inevitable … you know, we’re immigrants. I don’t expect to be treated like I was a fifth-generation American, … but I think that we can add things and we can give opportunities to people to adapt, because their old lifestyle choices aren’t necessarily going to be enough for them either, so this can be another way you earn money living in a fishing community. The Island Institute is doing various smaller aquaculture projects out on the islands as another way to add to people’s income [so] they can still live on the islands. … It’s a very simple model, and it’s a very simple concept. You’re never going to be terribly rich and powerful, but it’s really a nice life. I’m always very careful to stress the fact that it is important to be profitable. You can’t do it well if you don’t have the funds. It’s really important to not cut corners, and that means investing in things. You’ve got to make sure that you can pay your bank for borrowing that money for that piece of equipment. Jenn: You need to be able to pay your workers’ salaries. Fiona: You do, and you need to be able to pay them proper wages. We have a small, dedicated team, and they’re wonderful. But that costs money, so it’s important that you keep your business model grounded in reality – you do have to sell these things, and you do have to make money on it, for two reasons. The social cost, but also the operation costs of what it takes to do this properly, out on the water. It was a big investment to build this building, so for us this is a bit of a new model, if you will. We’ve had to kind of readjust a little bit. We were in rented accommodations that really weren’t up to scratch. It was too small for us and our production. 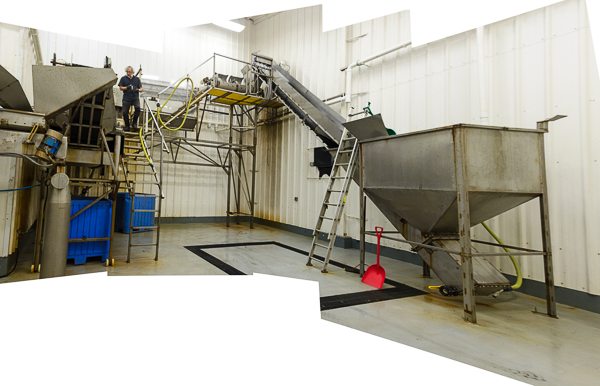 We couldn’t keep it as clean and tidy as we wanted to – it was just old and not really designed for a mussels-processing plant. … So we had to build. I mean really there wasn’t another choice. We have people like Alex and Max who want to follow on and continue to grow [some] form of aquaculture, whether it’s just the mussels or it’s other species, but it is going to take the long vision. This isn’t a quick boom-bust out of there kind of operation. This is a lifestyle thing that can work for generations, and it’s been proven to, but you’ve got to have the commitment, and your ways and your goals and ambitions are different if you do it this way. Jenn: So you’re building a multi-generational family farm. Fiona: Yes, exactly. Well technically, Theo took over his farming from his grandfather, so he’s already number five, and then Alex is now the sixth in total, but of course the second [generation] here. So yeah, it should be a generational thing. There’s too much to do in one lifetime, there really is! There’s so very much to do. Jenn: So are you guys still running the one that’s back in the Netherlands? Fiona: His cousin runs that one. We don’t have much to do with the day-to-day business. Theo was one of those proud waterfront village people in the Netherlands, so he can also understand the fishermen and the harvesters here, because … he’s got very deep roots from the village that he came from in the Netherlands. It gives you that level of understanding and that connection. And also if you’re out there working in February, not even the diehard harvesters are out there. Theo’s out there then. We harvest year round, unless it’s iced over completely. Jenn: That is one way to earn respect. Fiona: Yeah. Well, we always say it’s too hot for four weeks in the year, and it’s too cold for four weeks in the year. The rest of it is okay. We can manage. Jenn: So how long does it take for [mussels] to get to maturity? Jenn: Wow. That is a long crop. Fiona: It is. And you don’t just put them on the bottom and ignore them for two years. There’s some husbandry that’s involved, including removing starfish or keeping the eider ducks focused on wild product and not on farmed product. Redirecting their attention. They are predators that can do quite a lot of [damage] … They like farmed mussels, their high meat content, lower shell ratio. Jenn: So how do you keep them away? Fiona: We chase them around with a boat. Just to make it a little less comfortable on our farms. The thing is, there’s plenty of wild product they can eat. We’re not starving these poor birds. There’s plenty out there. It’s just that they like to do less effort for their food, and that’s normal. We all like that. Starfish are another predator. They come up from the deep, and they smother mussels in the bed. They suffocate them and then eat them. We’ve got a really cool solution to that. There’s a gentleman from Stonington, … his name is Dave Quimby, and he has a little company called Ocean Resources. Anyway, he dives for things that are used for dissection in either research or education institutions, and he dives for starfish. It’s one of his big products. So when we have an infestation of starfish we get him out there with his dive gear and he gets the product and we get them removed, so it’s a win for both of us. Jenn: How deep are the mussels? I’m having trouble picturing that. Fiona: That depends. To be qualified as sub-tidal, that means it doesn’t dry out, even on spring low tide, so they’re always underwater. There’s 12 feet rise and fall here, … from six feet to 20 feet is the area we’re kind of looking at. You can grow them in deeper water. We just have more shallow beds. Jenn: It seems like the deeper, the more difficult it would be. Fiona: Not particularly. It’s more that there’s more predation deeper, so the yield can be less. Starfish don’t like shallow waters because seagulls will dive through and get them, so they’re more prevalent in deeper water. So in the deep [areas], the starfish can predate year-round , tide-round, all day, all night if they want to, so they have more opportunity to feed on your product. Fiona: There’s so much to know, I don’t consider myself an expert on this at all. If you talk to Theo, he has got many more interesting and nuanced opinions, because he’s out there all the time. I think it’s cool. He’s always muddy though. Jenn: Mud doesn’t bother me. Schoodic had an intertidal stakeholders meeting, and they had some of the clammers, some of the wormers, people from the park, people from various state agencies. And me. Everyone went out and mucked around in the mudflats. It was awesome. Jenn: Although when they introduced me as an artist, I really got the stink-eye from the guys. By the end I was just part of the scenery I think. Fiona: Yeah. They have to work hard, Jenn. The wormers and the clammers, it’s a very hard way of earning money. Fiona: Yeah, a lot of them are, and there’s a lot of opioid problems, because of the pain. But it comes really from the grueling life … People tend to think, ‘oh drug addicts,’ but why are they a drug addict? Because it’s been prescribed to them for chronic, awful pain from physical labor. It does give me pause when old attitudes towards people who have those problems are outdated now. We know more about it. We know that it’s not necessarily a choice that they made, it kind of happened to them. And that’s not [true] for everybody, of course it’s not. But we had our own … We’ve had a learning curve with employees who’ve had all of these issues. Fiona: We are employing the boat crew and also the picking crew here. It’s unskilled labor. It’s not rocket science, they don’t need any qualifications to do it, so the sorts of people [who apply] are the ones who can no longer do those other jobs. They bring all these issues with them, so I’ve felt a bit like an outreach for the longest time. I mean I can’t do it like an agency would. I just can’t. That’s not what we’re here for, and I’m not qualified to do it. But it broke my heart a lot of the time. You hear their stories and you see their lives, and they’re brutally hard. And they seem pretty happy living that way, some of them. You have to kind of respect that this is what they’re used to, this is the life they have, and they’re not going to want to change it necessarily, because even a horrible life is what you know, and change is hard. Jenn: It’s challenging. I mean, I come from away, and there’s so much that I just don’t know. Fiona: And those levels of society don’t mix. There are like strata that don’t mix at all. And I’ve got middle class friends, and people from the lab, and they have absolutely no idea of the people that Kathy and I are working with some of the time. Not now, as I said we have a different team now, but when we were over in Hancock, it was tough. We’ve been called at two in the morning to bail people out after OUIs. It teaches compassion, but it also teaches that I am literally unqualified and unable to make a difference in these things. Somehow, we have to do that collectively as society. On an individual level, I am not able to do very much. A little bit of easing the pain where I can, but there’s very little I can do to make a significant difference in people’s lives. It’s sad because we have regular work year around. But if [people] can’t get to work, in the end what can you do? I’ve kept jobs open for them when they’ve been in jail for 10 days or whatever and come back again. But it doesn’t work in the long term. It just doesn’t work out. They end up fading out. They just disappear and don’t show up, and that’s it. Fiona: Yes, it is. It is sad. I think it’s such a waste of very useful, valuable people. They have value and they don’t even really recognize that themselves anymore, I don’t think. They’re not particularly sad. They’re so accepting of their difficult lives. You think ‘it’s possible to get out of this.’ It is, but not if you’ve never been shown a way or nobody else in your family’s ever got out of it. You’re sort of stuck. … There are really sad stories that you hear. This girl, I’ve seen her in tears because she’s had to say goodbye to her children when she goes to jail again. She’s heartbroken, but her mother kicked her out on the street at the age of 12, how is she going to ever make those other choices? She’s desperate for love and affection and some stability. Yet, she is now trapped in the drug world and can never really get away from it because now her body is taken over by the drug. But underneath it, there’s still that person under there. We tried very hard to help her, but it was very sad in the end. Jenn: It must be hard balancing the emotional part with what’s best for the business. Fiona: I’m a caring person. I have a masters degree in diagnostic imaging. Fiona: So, I’m a hospital people-person, right? It’s totally irrelevant to what I’m doing now. But the people and the empathy and the analytical side of it and seeing where problems are coming from and standing in other people’s shoes, I’m really good at that. But sometimes I have to make the decisions, which are hard, from the perspective that it’s better for the company as a whole. The company is … It’s like a coral reef. All sorts of things feed from it. It’s not just one [person.] We consider ourselves stewards of the company rather than owners of the company. I have payroll. I have responsibilities to people. I have responsibilities to banks. I have responsibility to pay my taxes. I have all these other responsibilities and I have to make the right choices for those as well. So, it’s not just the immediate person that I would like to be able to help. For me, the motivation has been working this company to a point of strength so it can carry on supporting a lifestyle for the boys and their families. Money doesn’t motivate me very much because I don’t really care about it that much, but working hard and making those difficult choices because it’s best for the children or the people who work with us. I can do that because that’s using the empathy that I have for them already. So, that helps to make those more difficult decisions. Jenn: Anybody who has a payroll has a community. Fiona: If you’re a family business, you do a lot of the work. My husband is the boat person, and does all the farming. 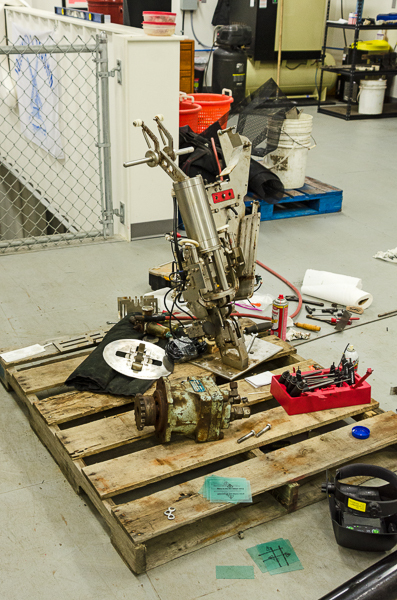 Alex does all the processing, and the engineering, and the repairs, and the technical stuff. He’s really good at all of that, and I run the business sales, distribution, business office, and policy stuff. So, we can swap around a little bit, but mainly we haven’t taken a holiday together in 12 years. Jenn: Oh my God. It’s time for a vacation! Fiona: Yeah, we don’t have time. It can’t run without us. One of us can go at a time. If I go to visit my parents, I go to England for three days, and then I’m back. You can’t miss your shipments. When the boys get older and we have slightly different situations, then we’ll maybe be able to do that. But I don’t really mind. I really don’t. Sometimes I get the afternoon off. It’s not like we’re working 16 hours a day anymore. We were working 12 to 16 hours, 6 days a week for years. The new building has [meant] at least Theo and I get a weekend together now. Jenn: How did the building change that? Fiona: Because we can do a lot of the processing here. To get the mussel to market is a two-day job because it’s in a sandy environment on the seabed. They need to be in clean flowing water for 12 hours to get rid of any sand that they may have ingested during the harvest process. That [used to be] done on the boat in containers with pumps. … In order to do that, Theo would harvest one afternoon. They would purge overnight on the boat. He would be back out at two or three in the morning. He’d do the first stage of the processing. [Then] they would need to be graded, de-bearded, washed, and then put in containers to come to the final stage of the final packing and bagging up and shipping. So the boat was busy for two days for one shipment, but now they harvest them in the afternoon, they bring them to the plant because we have a saltwater intake here. We stack them here overnight, which frees up the boat time. Instead of having to work six days for our market mussels, Theo has to work three days for our market mussels, leaving two to three days, depending on what’s going on, for the rest of the farm work, which is seeding-in, and monitoring, and husbandry, and all this stuff that needs to happen. So now he’s caught up with maintenance. He’s caught up with a lot of the monitoring programs, and things that he wanted to get going in evaluation. So now he’s able to take Saturdays off when work allows. The Hollander & Deköning boat, “Stewardship.” Photo from the company website. Fiona: So we actually feel that we are terribly well spoiled now because we have our own Saturday and Sunday very often. Jenn: I guess it’s all what you’re used to. Fiona: We’ve got a lot to be grateful for. We had to work hard, but there’s lots of people that have to work hard. It’s worthwhile work. You’re farming food for people. We’re not petrochemicals. … For me, it seems just a worthwhile thing to be doing. I enjoy it, I suppose. That’s the bottom line. … Farming is very vulnerable to environmental change of course. But you can’t sit there and worry about that for too long. You just do what you can, and the best you can at the time. Jenn: Are the mussels responding to the warming water at all? Fiona: They’re rather tolerant of it. The water’s still pretty cold. It’s warmer than it has been, but where we came from, the waters are way warmer and the mussels still grow. They won’t grow as well when it’s too warm. That doesn’t mean to say that they’ll die. They just may not grow as fast. That may have some impact on how you do things. You have to adapt perhaps. Jenn: That’s good to know. Fiona: Yeah, but you can’t lock this stuff in, Jenn. If I had to worry about all of those things all the time, I’d be too terrified to do anything. You have to have a little bit of faith that you’ll find solutions as you come across your challenges. Jenn: Do you have enough time to show me some of the process? Fiona: This is the water pump coming in from the ocean. That’s a filter to make sure we don’t get too much kelp and things like that coming in. That could block everything. Fiona: These are the purging heads. They’re just shower units. Alex built all of this. He bought a couple of pieces of equipment, but all the hoppers and belts, he fabricated himself. Fiona: I look at him and think, “And he had such trouble tying his shoelaces.” And he’s a father, Jenn. Can you believe it? Fiona: [The mussels] stack up under here three or four high, and the water goes through them, and then up and over, and through the next one, up and over. Any sand gets spat out during the process because they’re actually feeding once they’re there. So they’re perfectly happy. 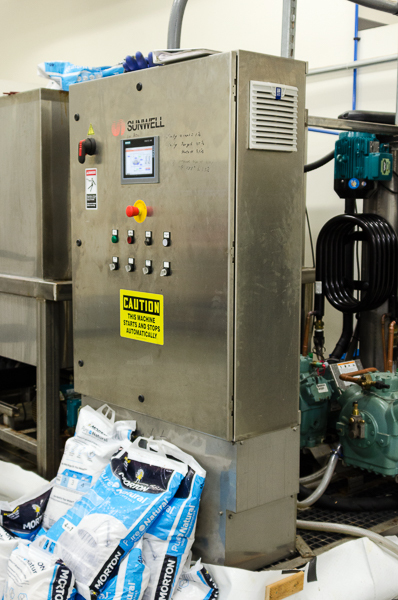 … Once we come in to do the processing in the morning, we turn that water switch off. And then this hopper is also full of seawater. So they never fall on anything hard. They fall into water all the time. Then, they go up. These sets of machines here … The mussels come in clumps with their beards. This separates them out there. It rotates slowly and breaks them into individual mussels without damaging the mussels, ideally. Then this one will let any small grits out. … Everything is covered in seawater throughout this whole process, it’s just a big wet mess in here. Then there’s a table grader, a debearding machine and then this little darling is an optical sorter. It photographs every single mussel, anything that goes through it. You program it using Windows XP. 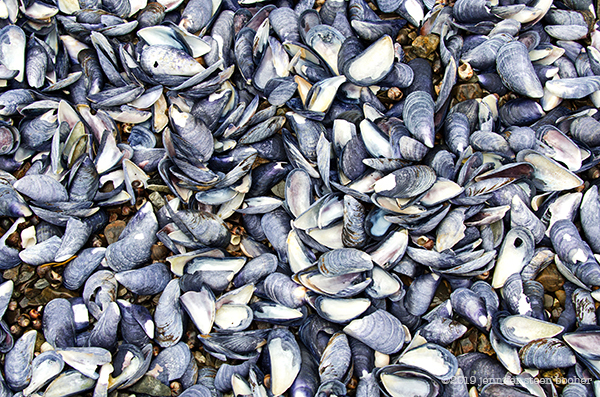 The software [is what specializes it] for mussels. They also use them for blueberries and carrots and skittles. They vibrate so they’re nice and evenly spread. Then, they literally image every single thing. They will select a reject and they’ll pop it out. It keeps all the data so you can look at what it’s rejecting, and you can adjust things. Alex has got programs in here for the different farms. As I said, they have different characteristics. They need a different program to pick them accurately. Jenn: Oh, of course. Slightly different colors and shapes. Wow. That’s really sophisticated stuff. Fiona: Say that had gone through the optical sorter and this would go through, this would be rejected. It gets shot out. There are 36 jets. Maybe 60. It sounds like gunshots. It’s a very clever system. This is what’s brought us up to the level of world-class processing … They have these in the Netherlands. This is not new, it’s just new for here. But I think there’s one company in Prince Edward Island that uses them. 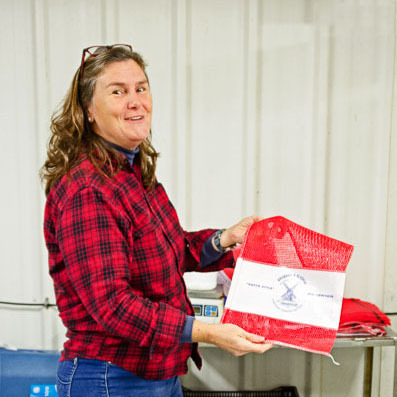 Fiona: When we’re shipping mussels, [we use] seawater rather than freshwater ice. Which means they keep their flavor better. 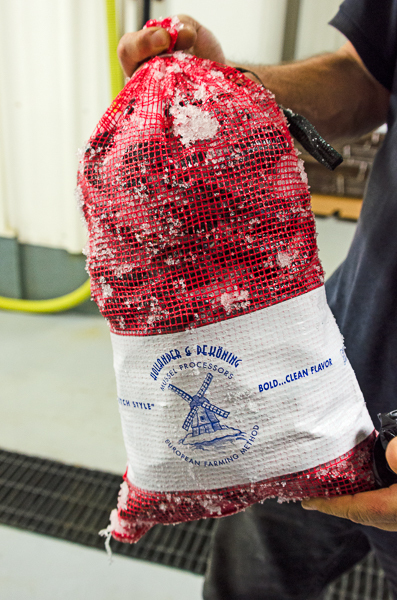 Also, it goes in between each mussel in the bag, so that every mussel has a layer of ice all the way around it. This [machine] was very expensive. It has put us in the marketplace because we have a really high quality product going out there now. We didn’t design it. They use them on boats, offshore fishing. 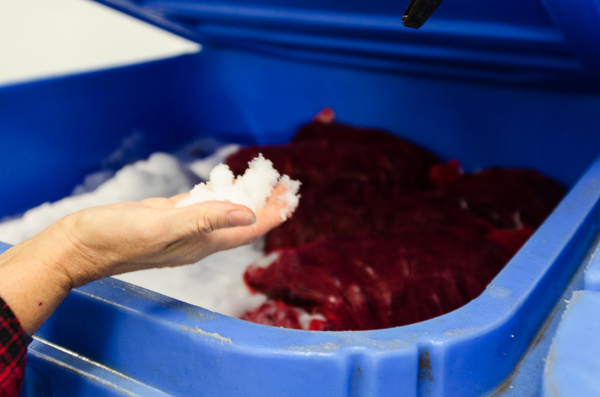 … This is the slurry ice – when it goes in, it’s liquid. The water drains out and leaves this ice behind. It’s at 27 degrees, a little colder than normal ice. They’re tiny little spheres. It gets to be quite hard. 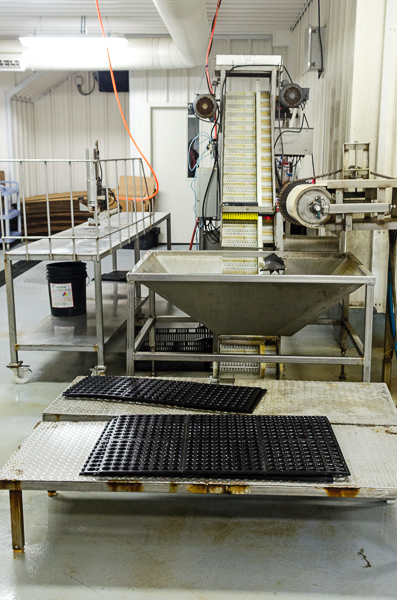 … This is the bagging machine. 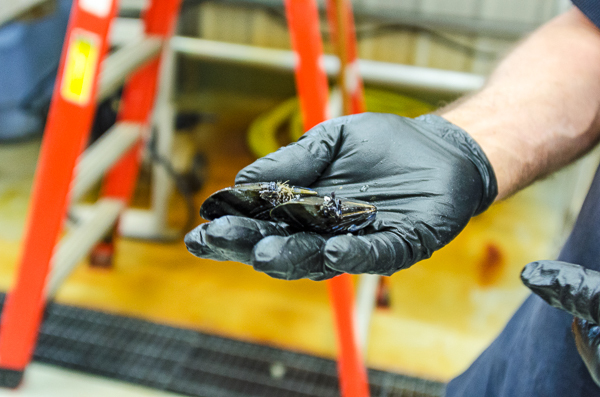 At the end of the process, the mussels come into this hopper. Fiona: This hopper has seawater in it. 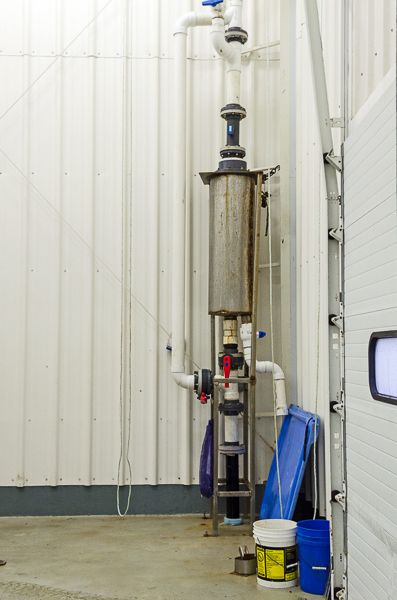 This is the seawater inlet that we set to a certain level. There’s a slow moving conveyor. You see it’s just running? It’s bringing out mussels gently and steadily the whole time. Then, we have three people standing on these benches here. Every mussel goes past three people as a final check. The machine doesn’t get everything, but this [process] does. This finishes it. These can be set at different rates to make sure that if they’re trickier to pick, then they’ll slow it down. If it goes quick, then they can make it faster. Then, this is the final bit. That machine weighs [out] whatever weights we program in. So for example our bags go in at 10 pounds, and we put some extra in. Then, they’re put on this table with tags, so they’ll have the proper labeling. This yellow pipe is where they pipe the ice in. If you’d like to see the machinery in action, there’s a glimpse of the process about halfway through this video about the de Könings. Fiona: They go in either a bag or a box. … We pack in .8 of a pound extra should there be a cracked shell, or they’ve lost a little bit of water in the traveling, or something like that, just to make sure we’re always above 10 pounds. Never underweight! So, that’s really it, and then they go in the cooler. As you see, there’s a few in there that we’re keeping for local stuff. But our product that was going down to Boston is gone already. It comes in, we pack it, and it’s shipped out within two hours or so. Fiona: Literally, we ship it out the same day it comes out of the ocean. We harvest to order. I don’t just bring them in and say, “Who can I sell these to?” I make calls, “What would you like? We will get them for you.” So they’ve got all the freshness in their hands and not in ours. It’s all about them really. They need to be able to taste the ocean, and not just taste something that’s sat in a cooler for a week and a half or something. Fiona: And these are where the farms are. So, we are here roughly, and we have a lease on Old Point, Lamoine; Hadley Point; Bean Island; Flander’s Bay in Sorento;and then over here at Blake Cove. We have 157 acres, it’s quite a lot. Jenn: That’s a lot of mussels. Jenn: What is going on here? Fiona: This is going to be a new tip and tie machine, where it puts a tag and a clip [on the mussel bags.] It’s like an automatic clipper. But this one, this is rescue. This is a poor sad thing that’s got to be rebuilt. It’s actually come out of the junkyard. We’ve got [a different] one, but this one will feed the label at the same time, so instead of having to manually put the label in and then clip it in with a metal clip, this will do it on its own. If we want to do those small bags instead of the big ones, we need to be able to do it faster than we can do with this one. People are asking for two-pound bags. At the moment Alex found that one piston is missing. He’ll get it working because it’s a puzzle to him. If [he can’t find parts] he’ll manufacture them. He bought a lathe. Mike who works here, he actually was in precision medical equipment. He used to build things like frames that would help with brain surgery, things like that. Really highly specialized and precise work. So he’s teaching Alex a little bit about how you do that properly. To my delight, Fiona handed me a bag of mussels to take home. I love mussels! Fiona: You see how the ice is? It’s gone between each of the mussels? There’s no void in there, and it goes into the interstices. These will last so nicely. I mean it’s going to melt, but just keep them drained. So, if you’re putting them in fridge, just put a wet tea towel over them and something to collect the drips. Don’t let them sit in it because they’ll try to filter and they can’t do that. Then, they should be good for days. It depends on how you use them. Jenn: Wow. Thank you! What would you recommend on how to cook them? Fiona: What’s your favorite recipe? Jenn: We usually just steam them and serve them with butter. Fiona: There’s one … What was his name? Jamie Oliver. If you Google ‘mussels from his granny’ or something. It’s very quick. I love that recipe. You have chopped up tomatoes, you make this paste and you let it cook slowly with fresh garlic and anchovies and then you cook it with pasta. Then, you throw mussels in. By the time they’re done, the pasta’s ready, and it’s ready to go. Jenn: That sounds fabulous. Fiona, thank you again! Fiona: It’s been a pleasure!